A care home is being investigated by police over the death of a vulnerable man who left the building unaccompanied and was hit by a lorry. The man, 70, died after leaving the Nada Residential and Nursing Home in Cheetham Hill, Manchester in February. Police are looking into safeguarding issues at the home as the victim was subject to a safeguarding order and should not have been unsupervised. The Care Quality Commission (CQC) has since found the home to be "unsafe". The victim was struck by a lorry less than 1,200ft (365m) from the home on Cheetham Hill Road. A man was arrested at the time on suspicion of causing death by careless driving. 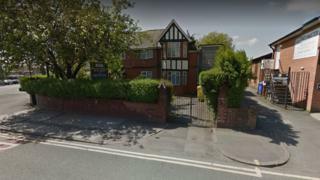 Greater Manchester Police said the care home was "fully co-operating" with inquiries into the man's death. The privately-owned facility is registered to provide care for up to 28 people who may have a combination of mental health and personal care needs. The CQC said the "serious safeguarding incident" raised concerns about the risk of residents leaving the home, particularly those who should not have been allowed out unaccompanied. An unannounced inspection on 8 March rated the care home, which was already in special measures, inadequate and in breach of three health and social care regulations regarding safety, safeguarding and governance. The CQC said there was a lack of guidance for staff in care plans, risk assessments and contingency plans if a person did not return home at the agreed time, as well as people not being shown the safest way to cross the road. Nada manager Pierre Grenade said staff at the home were devastated by the man's death. "We loved the man who died. I cried my eyes out," he said. He added that measures were being taken to prevent a recurrence and staff were working "very closely" with the CQC to improve care.